Hattori Tokei-ten (服部時計店, meaning Hattori Watch Shop) is a Japanese company, predecessor of Seiko. The company was founded in 1881 as a watch shop by Hattori Kintarō (服部金太郎) and settled in Tokyo, Ginza in 1887. It was incorporated as K.K. Hattori Tokei-ten (㈱服部時計店) in 1917, with a capital of ¥5,000,000. It distributed various cameras from the 1930s to the 1950s. The retail section was separated in 1947 and became K.K. Wakō (㈱和光), that is still installed today (2007) in the same Ginza building inaugurated in 1932. The company was renamed K.K. Hattori Seikō (㈱服部セイコー) in 1983, then Seikō K.K. (セイコー㈱) in 1997. Hattori Tokei-ten founded the Seikōsha (精工舎) plant in 1892 to manufacture clocks and watches. It remained the company's manufacturing branch of Hattori until 1970, when it became the separate company K.K. Seikōsha (㈱精工舎). It was split in 1996 into Seiko Clock Inc. and Seiko Precision Inc. The word seikō in Japanese means "precision" when written 精巧 and "success" when written 成功. In the name Seikōsha, the seikō character combination is different and is an abbreviation meaning "precision industries". The character sha (舎) means "house" or "building" and it is not the same sha that means "company" (社). The Seikōsha manufacturing branch would give birth to various other companies. The measure instruments section of Seikōsha was merged on 1 September 1932 with Katsuma Kōgaku Kikai Seisakusho (勝間光学機械製作所), said to be a subcontractor of the company, to form Tōkyō Kōgaku Kikai (the maker of the Topcon cameras that would become Topcon in 1989). The watch-making section was separated in 1937 to become K.K. Dai-ni Seikōsha (㈱第二精工舎). In the early 1980's, this branch is called SII but is more well known today as Seiko Instruments Inc. and it also gave birth in 1959 to K.K. Suwa Seikōsha (㈱諏訪精工舎), today Seiko Epson Corp. The Seikōsha manufacturing branch began the production of camera shutters in 1930 with the Magna, but volume production did not start until 1933. It made the first Japanese copy of the Compur shutter in 1932, simply called Seikosha. Many leaf shutter models followed. It seems that the camera shutter section of Seikōsha became Seikō Kōki (セイコー光機) in 1963 and was merged back into K.K. Seikōsha in 1986. When this company was split in 1996, the camera parts activity went to Seiko Precision Inc. (セイコープレシジョン㈱), that still (2007) makes camera components. 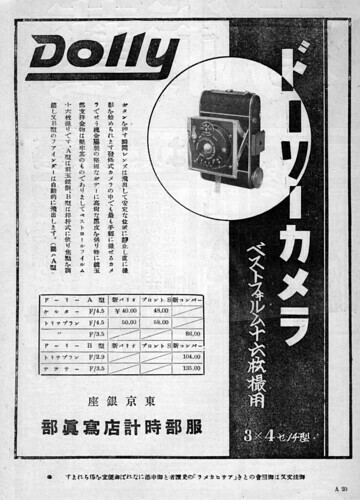 Hattori Tokei-ten also distributed imported products in the early 1930s, such as the Zeiss Ikon or Certo Dolly cameras. 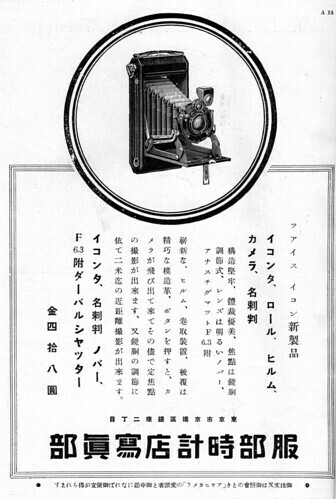 Advertisement for the Ikonta and Dolly (3×4) in Asahi Camera February 1930 and June 1932. ↑ Sources: Chronology of the Seiko Instruments official website, the biography of Hattori Kintarō in this page. According to this page by Uosaki Minoru about the Ginza building, the first shop was demolished in 1921 and replaced by the present building inaugurated on 3 June 1932. The address is Tōkyō-to Chūō-ku 4–5–11 (東京都中央区銀座4-5-11). ↑ Source: Chronology of the Seiko Instruments official website. ↑ Source: Chronology of the Epson official website. ↑ Source: Page about early Japanese shutters at the JCII Camera Museum website. ↑ Shunkan o torae-tsuzukeru shattā-ten, p. 12. ↑ All dates: Shunkan o torae-tsuzukeru shattā-ten. Asahi Camera. Advertisements by Hattori Tokei-ten in February 1930 (p.A18) and June 1932 (p.A20). Shashin Salon. 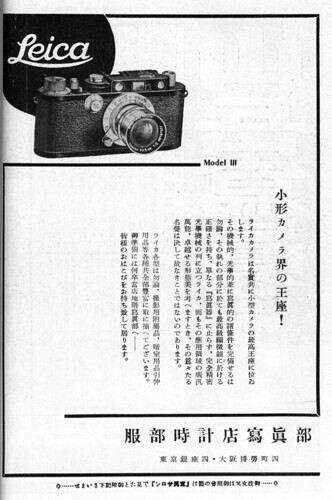 Advertisement by Asanuma Shashinki-ten in January 1934, no page number. This page was last edited on 19 January 2019, at 12:09.